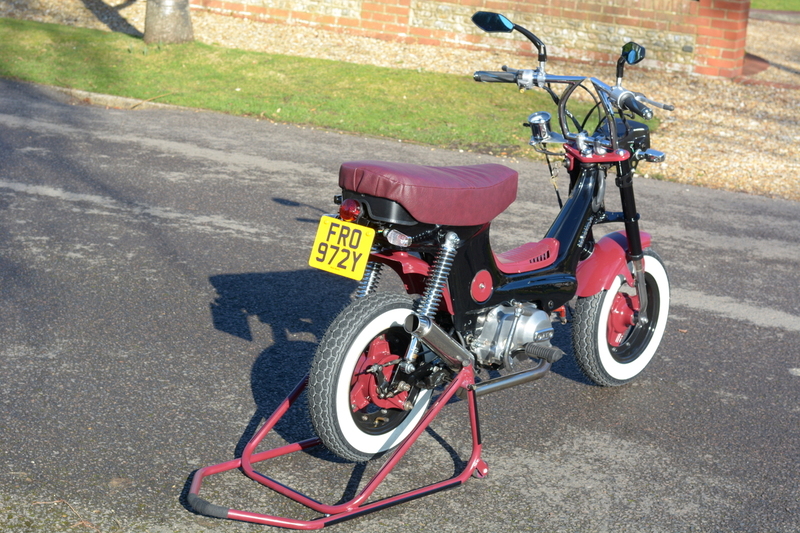 New Year has arrived and we stand staring at our half-finished ‘Monkey-Bike’ as the snow descends outside; we feel like expectant fathers in the delivery room…one final push needed before the garage doors open wide. Into the world will ‘pop’ our new creation and I need to wipe the moist area by my eye…not due to emotion; Alan just slipped with spanner whilst tightening a bolt I was securing…twatting me across the knuckles in the process! ‘Golly gosh that does smart a tad…you silly Silver Fox’ I exclaimed. The paint fumes are obviously finally getting to me but luckily the colouring is nearly complete. 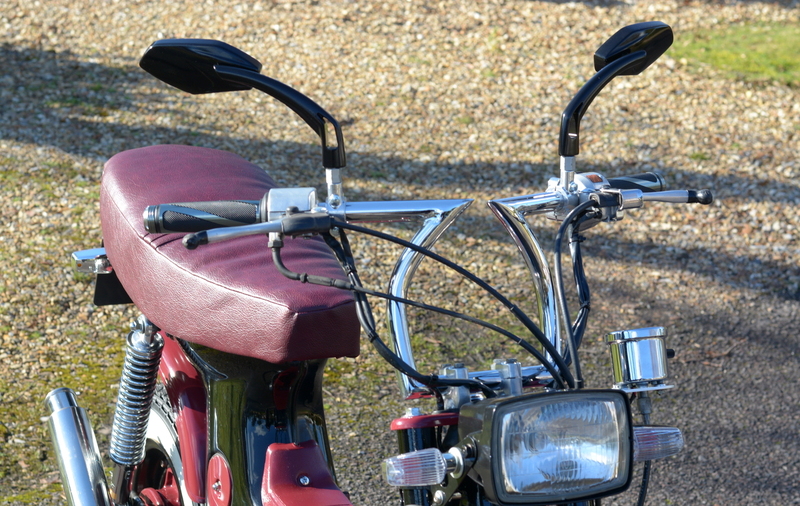 Our front mudguard came out perfect 1st attempt whilst the rear one took five goes before I could bolt it into place; didn’t help that I dropped it twice. The spaghetti that once was a loom finally became a bird’s nest inside the headlight cowl, the additions of a small ignition LED and power for our super mini speedo both work. Alan fabricated a couple of plates and this was secured to the top suspension/handle bar plate that had been painted to match the seat and wheels. 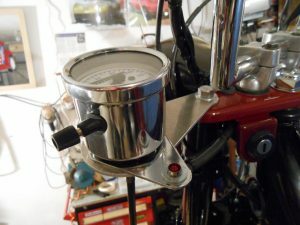 The rather unique headlight bulb arrived via the worldwide web, as did the low voltage indicator relay; both operated perfectly. 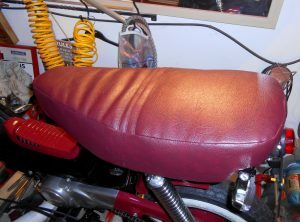 A massive ‘thankyou’ must be offered to Alan’s sister Geraldine McCormack who took our rancid seat foam, one tired base and several yards of burgundy vinyl and returned with one seat. Evidentially, she is not overly keen on doing another one, which I can understand but once any excess fabric was secured to the base we bolted the finished article back onto the frame; stood back and admired. This all led to the one task we were actually unsure about at the outset eight months ago, rebuilding the forks. The design consists of two springs plus four plastic inserts and several ‘C’ clips all coated in lashings of grease. No oil or seals are involved and our biggest issue was the base plastic tube that wrapped around our fork tube. 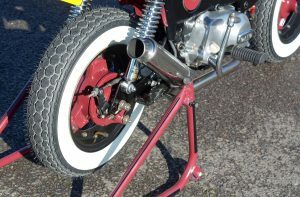 The original leg could be moved from side to side…not ideal, as the MOT inspector would be sure to fail, plus this part is no longer available. My clever colleague took the measurements from all the parts plus the offending item away back in October. Whilst I am not at liberty to divulge our source, some very high-tech equipment was used to construct a new pair and one cold Saturday morning in late January we began the rebuild process. First to re-enter the empty fork tubes was one large spring containing a bump stop. 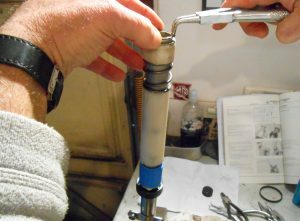 This was pushed to the top followed by a fully assembled combination of springs, plastic tubes and clips and after being forced into place secured by a circular snap ring. Another reason why restorers photograph and tag every part because six months later we certainly wouldn’t remember the sequence this lot came out in; not at our age…Alan can’t even recollect how old he actually is! One thing is certain his engineering talents came to the fore on this job and as long as you remember to feed him and finish the day with a pint of the cold stuff he won’t fail. 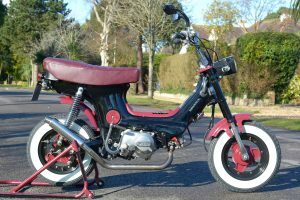 By lunchtime the forks sat in situ, returned to their 1983 specification with some 2018 technology and excitement in the garage was immense as the front mudguard fitted perfectly at the first attempt. 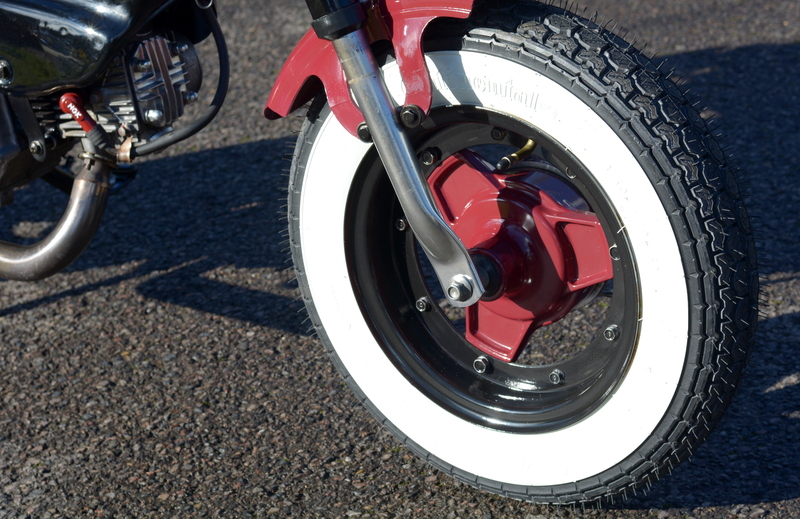 In next was the front wheel that I painted at the end of last summer, complete with ‘white-wall’ Continental and new brake shoes. 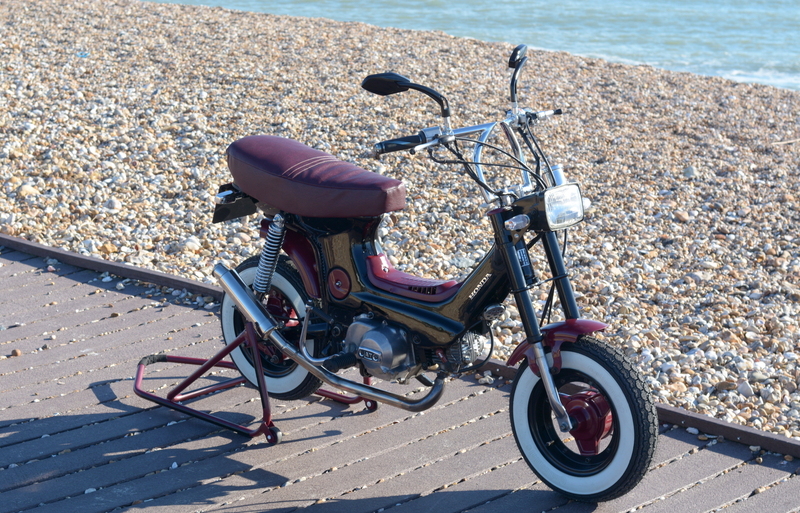 Speedo and brake cables connected and checked, then we took five with a celebration ‘sausage roll’… once written off as bin fodder a rather splendid mini-Honda sat proudly secured to our custom-made work bench. 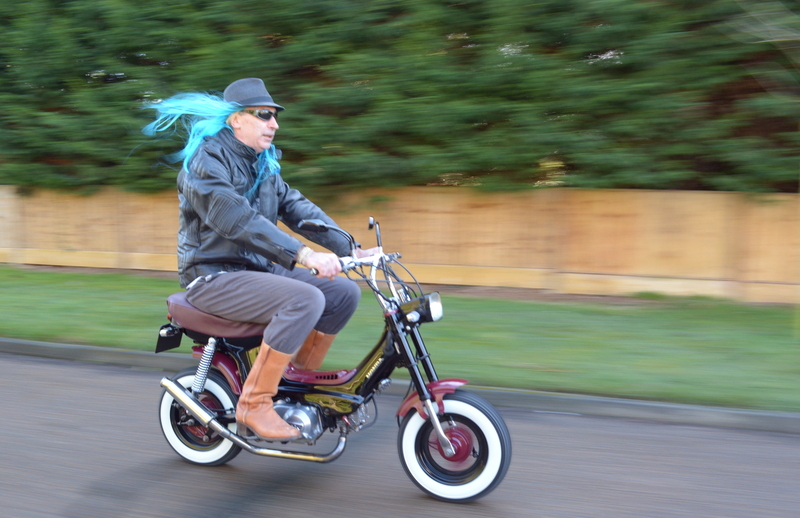 Did you know; In Tokyo, a bicycle is faster than a car for most journeys under 50 minutes but the Chaly is faster than a bicycle…just. The final task which we had somewhat overlooked was getting the fully rebuilt Honda back on terra firma. With one excited old boy at each end ready to lift, we got the wife to remove the securing bolt and wheel the bench away, well that was the plan. One hernia and one bad back was the result, but in the excitement of our imminent road test these were soon forgotten. Into the daylight she rolled, ignition-on and two heaves on the kick start all 72cc burst into life and boy that sporty new exhaust reminded the neighbours who lived just up their road!! 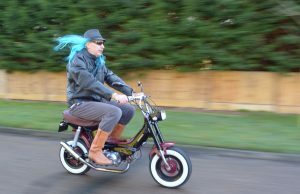 With plans for a future ‘big-unveil’ we tried to be discreet but the exhaust had other ideas as Alan took the maiden voyage; grinning like a Cheshire cat he boomed off up the street. One careful test ride of a few hundred yards saw him return, still very pleased. 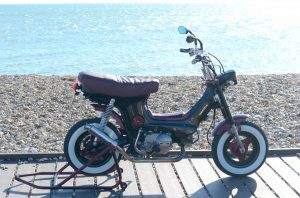 All the gearchanges worked and the brakes, suspension and handling were nearly perfect he reported, just as the engine stalled into silence. Then followed twenty seconds of panic as it just would not restart, I hadn’t even sat on the thing and it had failed already! 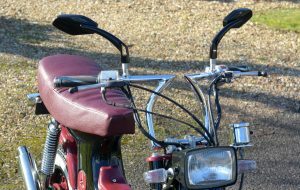 Top tip, it doesn’t matter how clever you are, no motorbike will run if you don’t turn the petrol tap to the ‘ON’ position. 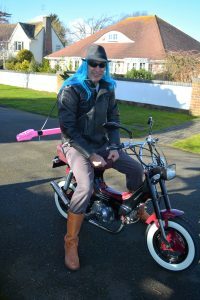 My road test went just as well but some adjustment will be required should the rider want to view anything but his own ‘mid-rift’ through the mirrors and the brakes will want a few turns before we bring that ‘famous celebrity’ round for a photoshoot with our pride and joy. We don’t just throw this stuff together you know! Overall appearance for our ‘finale’ photoshoot would also include one very old and rather battered paddock stand. With the Chaly’s centre stand on route to the local council depot we decided to redesign an old paddock stand that has been lying dormant in the loft. Firstly, our tiny Honda was heading for a rather large fall if we failed to modify and the clever ‘old fox’ decided to cut the existing mounts and re-secure in a lower position. Using the last of the burgundy paint our stand was then transformed into a thing of beauty (sort of) with black piping and new soft grip. Finally, we fitted securing pins and rubbers to protect the finish and our display stand was ready to be admired; sad what folk get up to with time on their hands. The photoshoot created huge interest and we were surrounded by at least two or three interested bystanders, one couple enquired ‘What is it?’ whilst an elderly gentleman informed us that he too owned a DAX version and it has been in his garage since 1985. Small world. We fled the attentions of these overzealous ‘groupies’ and managed to put five miles onto the speedo before I was able to prize the keys from Alan’s grip. I felt it only fair that after his months of hard labour the first official distance ride should be his, also if the wheels fell off he would bounce better than me. This ‘road test’ was to confirm the performance and handling of the Chaly and ascertain any adjustments that were required; his technical report concluded ‘that’s bloody brilliant and bloody loud’. 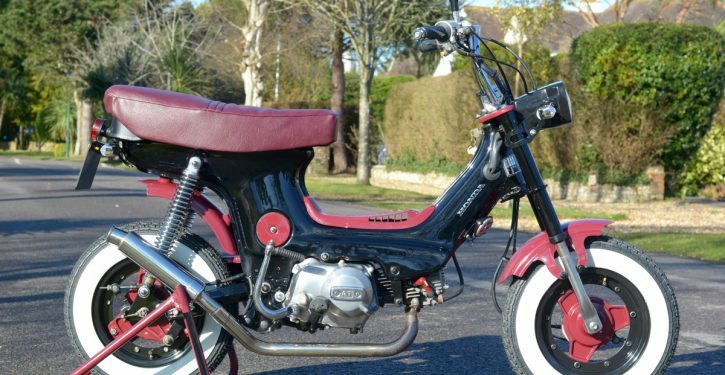 Well, the exhaust does emit the decibels of a Ducati, so the hunt is on to find something more suitable for the MOT testers ears. 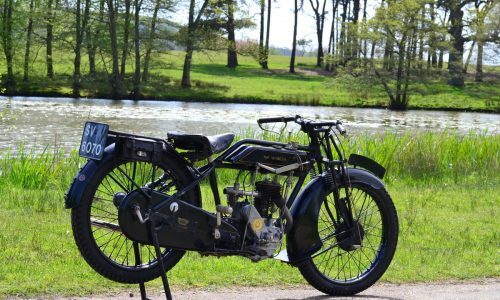 With a few classic cars and now several bikes under our belts we are getting wiser with each restoration and whilst our efforts may not be considered body shop quality, everything is done in-house. Not only does that make it financially viable but also reminds us, mistakes are there to be learnt from! 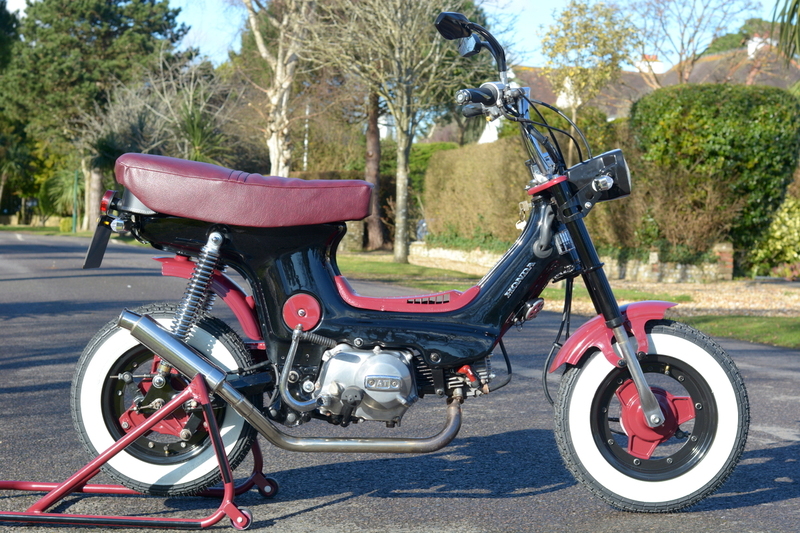 The Chaly has turned out to be our favourite, mainly because we were forced to think ‘outside the box’. 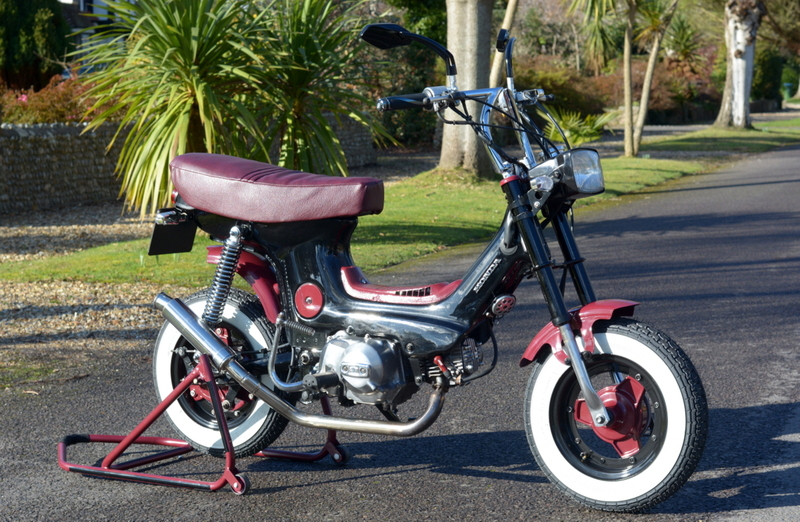 A full original resto was never achievable because the model we chose doesn’t enjoy much in the way of parts backup; all the home suppliers carry next to nil stock and whilst the far eastern enthusiasts do carry some but they are at a price. In this situation doing a ‘Fleetwood Mac’ is the only option and we went ‘our own way’ with both paint and replacement parts. Thanks to Sussex Rolling Road, motorcycle experts in Goring for insisting White Wall tyres would work whatever the cost; they do and were worth the extra. The Z handlebars, grips, rear light and indicators came from my old pals Gostopxu, Comyur, Cxig with Happy Deal who all live near each other in Hong Kong. Whilst chain & sprockets, battery, headlight mounts etc were all purchased locally everything else had to be sourced via the second-hand market place. The paint came from our usual supplier of all things colourful at Mountspace in Chichester; the remainder we made ourselves and included Alan’s moment of triumph when he produced replacement fork tube sliders. Thanks to Gary James for selling us the bike in the first place, we hope he is pleased with its salvation and new look. For those considering something similar we can only advise ‘just do it’. Most old Honda’s will likely run even if they have been buried down a coal mine for 50 years; so well engineered and the with ‘Monkey bike’ range that just continues to grow in popularity. A massive ‘cheers’ to Alan’s brilliant engineering brain (never fails as long as its kept fuelled with fried breakfasts and beer) which was kept ticking over with this project. Finally, a big ‘Like’ for Classic-Motorbikes.net for allowing my ramblings to be aired and those who took time out to follow our ‘tale of the ten-inch tyre – restoration’. We move onto our next project, so until next time its sayonara from Chaly central. 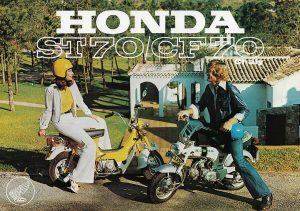 Watch rock legend ‘Slosh’ ‘play homage’ to and then test ride our Honda Chaly on classic-motorbikes.net ‘you tube’ channel at…………. 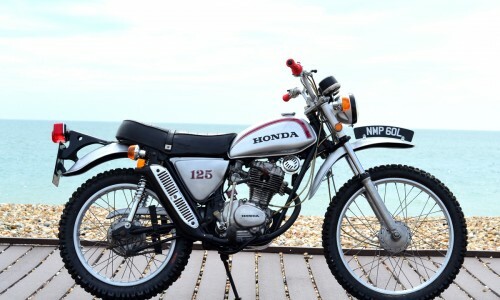 Honda SL125 Street Scrambler Salvation – The Conclusion!